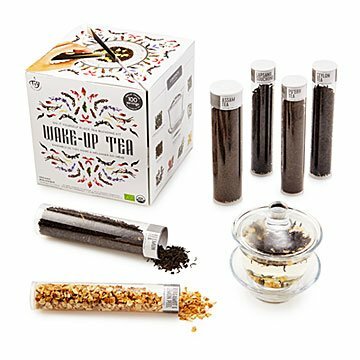 Mix these organic black teas and flavorful peels and petals to make your own blends. Tea is a profoundly sensual pleasure, and not only when you drink it: the ingredients are often beautiful and always wonderfully aromatic. With our all-organic Black Tea Blending Kit, become familiar with these individual tea blend components before you brew and drink them. Mix them together and create your own version of classic blends like English or Irish Breakfast, Earl Grey, or Duchess Grey. Then try some less well-known blends like Rose Congou, Russian Caravan, or Prince of Wales. Experiment with blends entirely of your own invention and have fun giving them outlandish names and bequeathing them as gifts. You can make about 100 cups with the ingredients included: Assam, Keemun, Ceylon, Lapsang Souchong, and Pu"erh black teas; bergamot and lemon peel, lavender buds, and rose petals for flavor. Instructions, recipes, and an elegant, traditional glass gaiwan—designed to steep your tea to perfection—complete the kit. Sourced internationally. Assembled in Canada. Bought this as a gift for a coworker. She loved it! She said she never realized there were so many differences in types of tea before. She really seemed to enjoy taking some time to explore tea rather than just grabbing a box off the shelf at the store. I could not update my prior review so I am adding this one. Both Grommet and the maker immediately responded and sent the missing items. Great gift for my best friend! My best friend is a daily black tea drinker and is always making creative cocktails and delicious food so this gift was a great combination of her interests. I couldn't pass up! She absolutely loved the gift and mentioned she had never seen anything like it. My friend loved the fun idea of mixing teas and she loved the taste. She said this was such a cute and thoughtful gift for her as actea lover. Wow! I have been searching for this kind of gift for a long time and I was not disappointed! The packaging is beautiful and the tea and ingredients taste great. I'll definitely buy this kit again for future gifts! My husband loves tea but he gets picky if there's too much bergamot in this Earl Grey or if the balance of his English Breakfast isn't just right. I love that he'll be able to measure out exactly what he wants and make his own black tea blends. It's like this kit was made for him!